Most, if not all, modern enterprise software needs to have a role-based user interface to support common-place use cases like, for example, devolved administration; i.e. User X is an coordinator for Group Y, allowing him or her to perform admin functions for that Group. This is just an example, of course, there are plenty of others. Spring provides support for many common authentication and authorization patterns and standards like OAuth2 and user management through LDAP or CAS. It also supports maturing REST models such as hypermedia through Spring HATEOAS and Spring Data REST. On the client-side, enterprises usually like to consolidate on a UI technology so that their apps have a similar look and feel. Obviously, angularjs is right up there (at the time of writing anyways…polymer anyone?) driven largely, I think, by its extensibility. Seems now-a-days that pretty much any service or directive you can think of is out there in github as a bower component. One such extension, pertinent to this article, being angular-hal. I wanted to have a look at how one might implement a role-based UI in a modern day SPA by pairing these technologies together. The complete code for this article can be found in my github repo here. So, before we begin let’s set some context. We are operating within a Spring boot-based web application, secured with a handy (for demo purposes) in-memory user database. To navigate this application it will offer a hypermedia-based REST API for managing these users. Client-side, we then front this hypermedia API with a role-based UI allowing ADMINs to add or remove users, allowing ADMINS or COORDinators to reset passwords, while USERs can simply just view users and do nothing else. The type of resource doesn’t really matter, the pattern presented here applies regardless. I chose user management as it meant the app could be self-demonstrating, and that appealed to me. The app in github, especially security-wise, is based on Dave Syer’s blog post. This was part II of a (currently) VI part series. Excellent, by the way, and I thoroughly recommend checking them out. Part II was adequate for my purposes. From a HATEOAS perspective I also used Greg Turnquist’s blog post as a jumping off point. And from a hypermedia standpoint I am basing my approach on Oliver Gierke’s RESTbucks presentations. Features and functionality of the app are very simple indeed. You can log in and out and manage users. Initially, there is only one user; username wozza, password dotio and this users is an ADMIN so he can create other users and set passwords. The idea therefore is to log in as wozza and create other users with different roles, log out and log in as those users to see how it affects the usability of the app. If we do that we can now you can see Fred, who is a COORDinator, can reset passwords but can’t add or remove users. As wozza we could add a third user, Barnie Rubble for example, with role USER and then we would see that he can view users only but I’ll leave that up to you. You get the picture. 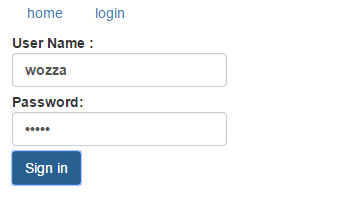 On the server-side I have configured form login-based security that also uses a custom user details service. This is a really, really simple in-memory user database. So, note if you reboot the app you are back to the wozza user only. Hypermedia-wise I have a root SiteController that is the entry-point, offered at /api. This links (via a linkrel) to the UsersController that manages the collection of users and this in turn links to the UserController for managing individual user resources including setting their password. Therefore from the single known entry point /api the client can follow the “users” linkrel to get the set of users and potentially follow the “password” linkrel for an indiivdual user to update the their password or follow the “delete” linkrel to remove the user from the system altogether. 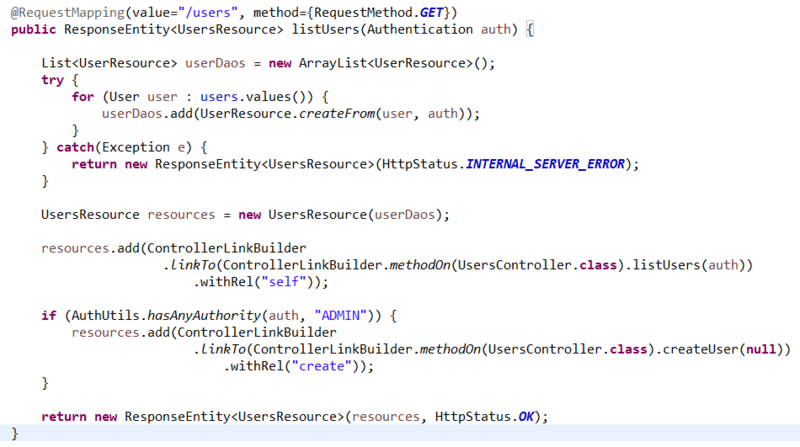 Here we can see that in the UsersController.listUsers request handler we have injected (using standard Spring MVC) the security context’s Authentication object. This then allows us to either add links to the users resource, or not. In this example we are adding the self linkrel regardless (because users collection is available to everyone) but only adding the create linkrel if the current principal has ADMIN authority; i.e. only admins can create new users. Again we can see the self linkrel is added regardless, everyone can see a “user”. But we only add the password linkrel if the current principal is an ADMIN or a COORDinator. And only add the delete linkrel if the principal is an ADMIN. Note, the presence of the create linkrel on the users resource itself and the password and deleted linkrels on the user resource. Where, as you will probably expect by now, we don’t have the create or delete linkrels but do still have the password linkrel. …so we aren’t simple relying on the web client, which is inherently weak of course. Any malicious attempt to call a resource without proper authentication is going to result in a 401 Unauthorized. OK, so the backend programming model is simple. Hopefully, it is fairly obvious how we can use the presence or absence of these linkrels on the client-side to now show, hide or disable components of the user interface. So, let’s take a look at that next. There are several angular modules that support the application/hal+json mediatype. As mentioned in the opening I chose angular-hal primarily because as it was small, simple and seemed to do what I required as I was initially thinking about this. To set some context here as well this is just a standard angularjs app BUT important to this article is that the hypermedia approach of linkrel following allows us to consolidate on a single angular-hal service, halClient, for interacting with the REST API regardless of the type of resource. This is important. I have found that this replaces the many type-specific services that I have been writing up to this point (I don’t like $resource before any one asks). allowing us to re-use this object to follow these linkrels further into the server’s REST API. Note, that we save this object to $rootScope.resource so that we can refer to it from anywhere. Note the presence of the create linkrel on the users collection itself and the presence of the password and delete linkrels on the “wozza” user resource. by storing the usersResource as the local scope variable resource and by storing the embedded users collection in local scope variable users. An interesting aspects of this, that I havent had time to investigate yet, is how application navigation typically maps to REST API navigation. I didn’t use it in this simple demo app, but I suspect in a more complex application using the ui-router (and its nested views) it will likely end up that as you navigate deeper into the application, you will also navigate deeper into the REST API, thus this $scope.resource overriding pattern might prove quite natural. You can see here that we show the table “create” row only if the create linkrel is present. Similarly, we disable (rather than hide this time) the Remove and Set Password buttons based on the presence or absence of the delete and password linkrels. It is important to note here that we are checking the user object here, not the users collection. That is about as far as I will go for this article. I like this approach as it gives really easy to understand and implement programming paradigm on both the server and the client. On the server-side Spring, Spring MVC, Spring HATEOAS and Spring Data REST have all made creating role-based controllers super easy. Likewise, on the client, LuvDaSun has done a great job on angular-hal allowing the server’s hypermedia to be consumed with no effort leading to nice, concise client-code. Now, with this great power, comes responsibility. Just because we can do this, doesn’t necessarily make it right? And that is a more philosophical question where I would like to get some feedback on from my readership please. My take on it is that using Spring’s principal to decide whether, or not, to add linkrels to a resource is I think, considering prevailing trends towards micro-services and super-user sessions to backend data sources, well-aligned. Conversely though, in more traditional on-premise enterprise platforms, like Documentum, authorization decisions are usually provided by the backend data source. It is more secure. However, what I have presented here could easily be adapted to defer these decisions to the data source instead. There is lots I haven’t looked at here. I haven’t paid any attention to the excellent Spring Data and Spring Data REST. Spring Data REST uses ALPS which is an integral part of a proper hypermedia API of course. So, I would like to investigate adding ALPS. For example, clients could discover what the password linkrel actually does and whether it is idempotent; i.e. a PUT, or not. I would also like to look at using ResourceProcessor’s to take a similar approach to that proposed here to add role-aware linkrels to Spring Data REST resources. I think this combo could be very enabling.